The Grad Centre (a.k.a. Halpern Centre) has two boardrooms (rooms 108 and 112) available for graduate student activities. 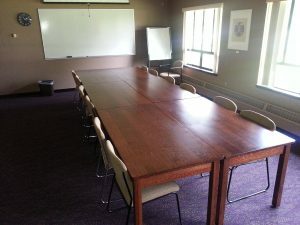 There is no charge for Graduate Students’ Society members to book the board rooms when the event is organized by graduate students and primarily related to graduate students. Book a room Contact the GSS front office to book the meeting rooms. Room 112 is the smaller of the two boardrooms. 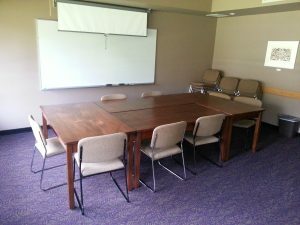 This room is used mostly for smaller meetings and functions and it offers a white board. The room can accommodate 10 people around a table. Room 108 is the larger of the two boardrooms. It can seat 16 people around the meeting table, and more with additional seating along the wall. The room has a white board and screen for use with a projector. Please note that you can set up either Room 108, 112, or the combined rooms according to your needs as long as you return it to its original format afterwards. There is a room set-up map posted in each room and failing to return the room to its original format may result in resetting fees. Due to BC Liquor License restrictions, any alcohol on the Grad Centre premises must be served by a Grad House staff members and can only be consumed in the restaurant area. Failure to adhere to this policy will result in a total loss of booking privileges. Alcohol cannot be consumed in the board rooms, hallways, or foyer. Please note that the Grad House is not currently taking catering orders. We will update this page once we begin to do so! Can I host a party in one of the rooms? Our rooms are available free only to graduate students for graduate student activity. Personal events and business activities on part of grad students – such as weddings, parties, tutoring, workshops held for a fee – do not constitute free rental. If I am not a grad student, can I still book a room? Yes! All UVic staff and departments, undergrads, and professors are charged a university rate to book the room. External community members are charged the regular rate – please see the below chart for pricing. Courses offered to graduate students by the university do not qualify for free bookings. What are the rates for hiring the rooms? Unfortunately, we do not currently have a projector. Please speak to UVic AV services before your event to ensure that your audiovisual needs are met.